priest named Father Cooke. The claims were of two young nurses who had communicated with what they thought to be a human spirit. There was also a report that one of the girls’ friends had been attacked physically. At the time of the referral activity was still in progress. The story starts a bit before, a year before the Warrens were called. The Mother of the doll’s owner purchased the then antique doll for her daughter’s birthday. The owner was in college, about to graduate from a nurses program. She had a small presentment with which she shared with another nurse. As the doll was the size of a four year old child, she placed it on her bed. The owner didn’t collect dolls, the gift was more of a novel decoration. However shortly afterwards the roommates started to notice all was not right with the doll. It started out small. The owner would leave the doll sitting on the side of the bed with the arms and legs straight. When they would come home from work, the arms and legs would be crossed. In her interview with the warrens The client stated: "I put it on my bed each morning after the bed was made. the Annabelle doll was sitting in a chair by the front door. It was kneeling! told the Warrens. "She was seven years old and her name was Annabelle Higgins. had compassion. 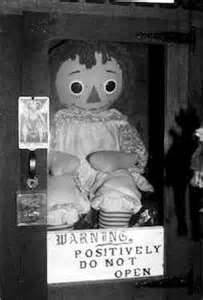 Anyway, we called the doll Annabelle from that time on." time in this apartment?" Ed asked. "No," both the girls answered. "Let me ask you something else." said in reply. "It’s a damn voodoo doll, that’s what it is," Lou blurted out. myself, no matter how hard I tried." alone and walked over to the thing to see if anything unusual had happened. "He won’t talk about that part,"
there on his chest was what looked to be sort a of claw mark!" There were seven cuts in the claw mark. Three vertical, and four horizontal. demonic has to somehow get your permission to interfere in your life. Lou didn’t believe in the charade, so he was an ongoing threat to the entity. you might have been killed." apartment and people were free from the inhuman spirit entity. the car stopped immediately, allowing the Warrens to reach home safely. I'd also like to note here the curious fact that this article did not want to post itself either here or on our facebook page. Interesting... who knows!